In 1994 a very old photo was discovered and reported to be by far the earliest image of Joseph Smith, Junior, the founder of Mormonism. 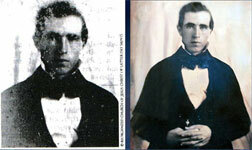 Since then, technology has been used to compare the image to a much later daguerreotype, painted portraits such as the one shown above reportedly based on the daguerreotype, and to his death mask. The measurements appear to indicate that although this image looks very little like Joseph appears in painted portraits copied from earlier portraits, themselves copied from still earlier ones, and others based simply on adoring imagination, this one appears that it may very well be of Joseph. Some are sure it is, others just as sure it isn’t. Joseph Smith, Junior, was born in Vermont and grew to manhood in Western New York in an era of population movement, extreme religious questioning, and change. Readers today may be incredulous at the ease with which he found acceptance of his claims to have spoken personally with God the Father, Jesus the Son, and apostles and angels numerous times beginning at the age of about 14. Perhaps even more surprising was his willingness to declare money digging with the use of a peep stone as his main employment as a young man. But in that era, he was not alone in proclaiming supernatural news or claiming supernatural powers. When Jo. was born in 1805, the population of the still-new United States lay almost entirely to the east of the Appalachians–the American Revolution had driven England from the 13 colonies, but not from the vast Great Lakes region beyond the Appalachians. The British maintained forts and troops there until defeat in the War of 1812. Then settlers began pouring through the gaps in the mountains and into the “West”: Western New York and Pennsylvania, Ohio, Indiana, and Illinois, and through the Cumberland Gap into Kentucky, farther south. Many left behind the old beliefs and constrains of New England: starting a new life in a place settlers had never come before was a heady freedom, and the freedom was extended to the form of their faith. Organized religion went through a massive change. 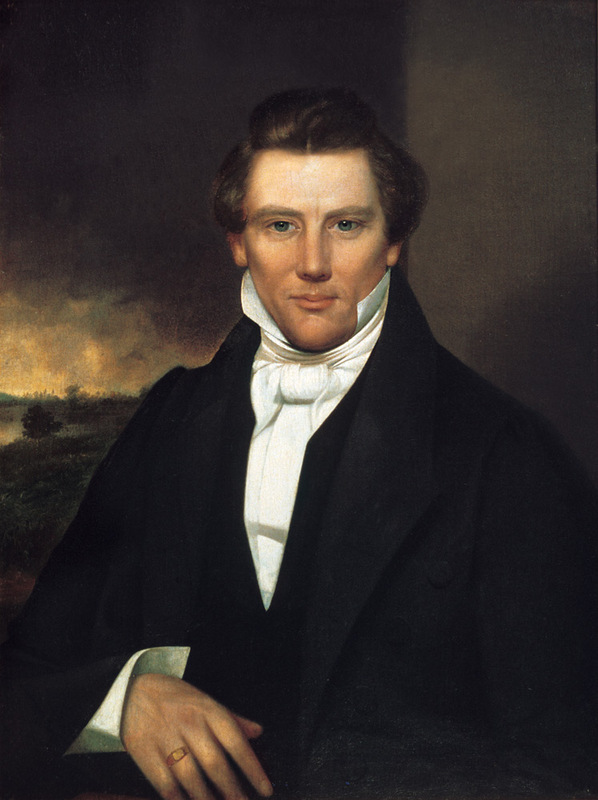 From the end of the War of 1812 to Joseph’s publication of the Book of Mormon in 1830, Methodists formally split into two distinct parts over the issue of slavery, and more than half a dozen factions of Baptists were organized, including Reformed and Free-Will; in addition, others which had long existed moved West, like the German Baptist Dunkards. Ann Lee, founder of the Shakers, left New England for New York with her followers. Also in Western New York, Jemima Wilkinson declared herself to be Christ, and also gained dedicated believers. Thousands streamed into clearings in the woods to hear itinerant preachers at “camp meetings.” Alexander Campbell came from Scotland to New York, then Philadelphia, then to Western Pennsylvania, where his “restoration” movement to “return to the ancient order of things” had impact on many denominations, and resulted in the formation of the Christian Church, Disciples of Christ. The Smith family also moved west, from Vermont to the Erie Canal town of Palmyra. Western New York in 1830 was fertile ground for a young man like Jo. Smith, Junior! Brodie, F. M. (1975). No man knows my history: The life of Joseph Smith. New York: Vintage Books–Random House. This entry was posted in Uncategorized on December 1, 2015 by lrmayfield.